The war record of Little Irchester was a proud one indeed, and one that will hardly be equalled by many parishes of its size. The village contains slightly less than 100 dwellings, yet 53 men went and saw service with the Forces. Of these 17 made the great sacrifice, and to commemorate their valour a dignified memorial was unveiled and dedicated on Saturday afternoon. Standing just over the level crossing, and at the junction of the roads, the memorial occupies a prominent position, and is railed off. A few minutes before the hour fixed for the ceremony on Saturday the ex-service men of the village marched from the schools under Lieut. Francis, and these were followed by a united choir, singing as they came the hymn, "For all the saints." The Irchester Parish Council, with Mr. F. C. Grey (chairman), was also in attendant is. With the Rev. W. J. B. Kerr, vicar of Irchester, were Mr. H. E. Neale, lay reader, the Rev. F. T. Williams, pastor of the Victoria Congregational Church, Wellingboro', and Capt. R. Dudley Pendered. Wellingborough. The service commenced with the singing of the hymn "Through the night of doubt and sorrow," after which prayers were offered by the Rev. W. J. B. Kerr. Capt. 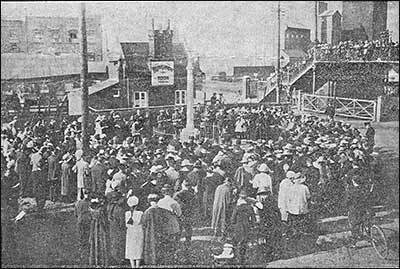 R. D. Pendered then proceeded to unveil the monument. Before drawing aside the Union Jack, he said that he felt it a great honour to perform that sad and sacred duty of unveiling a memorial to the seventeen sons of Little Irchester who gave their lives to save the country's honour. If he might say so, he thought they had asked him because he, as a serving Territorial, was at the post of duty when the country called. He had probably seen service with some of those lads whom they commemorated, and he had been able to judge for himself of the bravery and devotion to duty displayed among hardship. That memorial tended to help them to imagine that the bodies of their brave comrades had been brought into the parish, and he felt sure it would be honoured and revered for all time. Having expressed sympathy with the bereaved he drew aside the Union Jack which covered the memorial. The hymn, "Soldiers who are Christ's below," having been sung, further prayers were offered by the Vicar, and the lesson, from St. John xi. 21-27, was read by the Rev. F. T. Williams. Mr. W. Brawn, the well-known local bandmaster, impressively sounded the "Last Post." A commendatory prayer by the Vicar preceded the dedication, which was performed by the Rev. W. J. B. Kerr, and immediately after the dedicatory prayers had been said, floral tributes were laid at the foot of the memorial by Capt. Pendered and Lieut. Francis on behalf of the ex-service men, and by Mr. F. C. Grey on behalf of the Parish Council. There was also a remembrance from the War Memorial Committee, and during the singing of the next hymn, "Take up thy cross," the relatives and friends of the departed heroes laid their tributes on the memorial. When these had all been reverently placed in position, the base was covered with beautiful flowers. The ''Reveille" was sounded before the hymn was sung. Alter the hymn the Rev. F. T. Williams delivered a brief address. He said the men they were paying homage to had laid down their lives in order that the generations following might live in the enjoyment of liberty and peace. This land of ours had surely been baptised in the blood of its sons, and as in the past, the blood of martyrs had proved to be the seed of the Church, so from the sacrifice of Englishmen would rise another generation cherishing the same ideals, and the same devotion to tying and Country. They were men great in the essential qualities, and it was well that there should be some permanent memorial to them as a reminder to those following lest they failed in discharging the great task the dead had handed down. To those men the call came as a call of duty. They were not seekers of glory, although they found that the path of duty was the way to glory. They were not dead, merely had they passed from the sphere of present activity to a sphere of service further on. The war brought a firmer belief in the future life. The task those men set their hands to was by no means finished yet. When they joined up those promises, were made to them. Perhaps the coiners of those promises intended that peroration should be turned into reality, but it had not been done as yet, and it remained for all to see that the unemployment and deplorable conditions of too many ex-service men were wiped away. That could be done by re-introducing the old wartime spirit of self-sacrifice, and with that the problems would not be incapable of solution. The concluding hymn was "On the resurrection morning," and the service, after the Blessing had been pronounced by the Vicar, ended with the singing of the National Anthem. The singing was accompanied by Mr. C. V. Freeman on the organ. 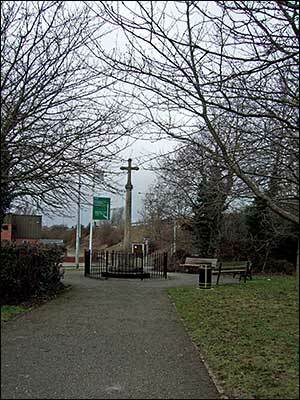 The memorial, which is of Weldon stone, consists of a pillar surmounted by a cross. It was erected by Messrs. T. H. Higgins and Co., and the concrete base and foundations were gratuitously supplied by Messrs. C. Adams and Co. It is inscribed: "To the glory of God and the eternal memory of those who gave their lives to save their country and preserve liberty in the Great War, 1914-1918." Then follow the names of the fallen, viz. : A. Battison, H. J. Bradshaw, A. J. 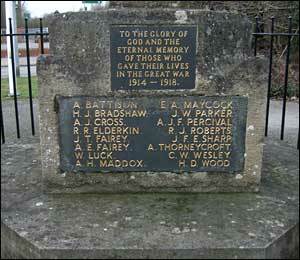 Cross, R. R. Elderkin, J. T. Fairey, A. E. Fairey, W. Luck, A. H. Maddox, E. A. Maycock, J. W. Parker, A. J. F. Percival, R. J. Roberts, J. F. E. Sharp, A. Thorneycroft, C. Wesley, H. D. Wood, and A. W. Sharp. Mr. W. J. Marsden was the chairman of the War Memorial Committee. Mr. E. Rickens was the hon. secretary, and Mr. H. Goff treasurer. Man Gassed—Bombardier F. C. Hartwell, of the R.G.A., son of Mr. and Mrs. T. C. Hartwell, Little Irchester, is now in Queen Mary’s Military Hospital, Whalley, Lancs., suffering from the ill-effects of a gas attack. For a time he lost both his sight and speech, but the former has now been recovered, and it is hoped that the latter will follow. Previous to joining up he worked at Messrs. Nicholson, Sons, and Daniels. Twenty-two-year-old Flight Sergt. George Whale, only son of Mr. and Mrs. W. G. Whale, of 21, Newton-rd., Little Irchester, has been awarded the Pathfinder Badge. He has completed a total of 60 operational flights, 31 of which were with heavy bomber forces and the remainder with the Pathfinders. Before joining the R.A.F. in 1943, he was employed by the Stanton Iron Co. and was a member of the Boys' Brigade at Little Irchester. He was educated at Victoria Schools.